It’s been relatively quiet at Demarest Lloyd State Park, after the site supported the most bustling shorebird community in its history including the most piping plover pairs ever for the site, and possibly the highest productivity in Massachusetts for a site of its size. A vibrant Least Tern colony added to the bird hoopla at Demarest Lloyd in 2013. 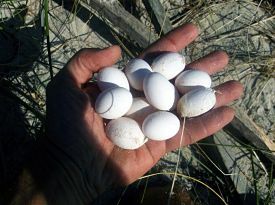 Amidst the current silent state, there is some noise below ground, made by the endangered Diamondback Terrapin (Malaclemys terrapin terrapin) for which a nesting female was found this season, and eggs have begun hatching at this time. For a nest discovered back on July 6, a first hatching was confirmed for the remaining viable eggs (6 of 13 egg clutch) on October 4, after 90 days of incubation. On October 15 (day 101), the most recent visit, one turtle was nearly out of its shell, the other eggs hopefully close behind. Incubation times range anywhere from about 60 to 120 days for the nests, depending upon various factors including temperature and moisture, so this could be considered a relatively long period of incubation beneath the beach sand. So what’s the fuss about one nesting turtle, and so far, just one confirmed hatchling? Aside from the obvious fact that any confirmation of endangered species is evidence of an intact natural heritage we’re striving to preserve, finding these turtles is a challenge. While a morning high tide in June or July is sure to bring a turtle ashore to nest somewhere, the timing of the nesting wave varies from year to year, and many years may occur at night. Only during a few years since discovery of the first nesting terrapin at the park in 2005 did large numbers come ashore coinciding with our plover visits. Therefore, every turtle is a big find. Any turtle emerging from the Slocum River onto Demarest Lloyd also may cross pavement or nest near picnic areas, especially those emerging from Giles Creek, further reminder of the ecological significance of a terrapin. As for the hatchlings, mortality is extremely high, many turtles never surviving the long crawl from the hatch site to the safety of the estuary or salt marsh creek, before suffering predation. Furthermore, harsh fall and winter weather can take its toll. The simple remaining task of weekly checks and ultimately transporting however many hatchlings emerge to the safety of the salt marsh creek where they will spend the winter, is an important one that adds one more turtle to the population, and a potential educational specimen for future generations. 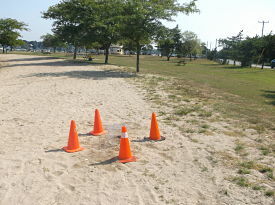 New this year was confirmation of nesting terrapins at another Dartmouth site, the beach at Apponagansett Park that is the shoreline of Apponagansett Bay estuary. This nest which contained seven eggs at the time of our visit was discovered by a beach walker using a metal detector (egg detector? ), which we protected on August 20. The confirmation of hatching underway on August 28 tells us this was likely a June nester that survived a long period on a busy local beach. While we weren’t able to determine the fate of hatchlings, this is an exciting discovery that provides useful data for the ongoing initiative to learn more about the Diamondback Terrapin population in the Buzzards Bay region.